The Slot 21 online slots game is the latest release from Slotland casino in 2017. They started off the new year by launching the Alice In Wonderland Slot. Now it is not even the end of the first month of 2017, and they have created an online slot machine that is a combination of the blackjack game with a slot machine. Slot 21 is a 5×3 video slot that features five reels and 21 possible pay lines to help you hit some winning combinations. The way to win besides to line up five of the wild symbols and land the scatter icons is to score 21. The Slot 21 video slots game comes with a gamble feature, the 21 Bonus Game and the Gold icon that is the wild symbol! When you land the Gold wild symbol, it will substitute itself for all of the other symbols on the reels to help you formulate a winning combination. You have the choice to click bet up, bet down and well as adjusting some pay lines you are playing. Only hit the lineup or the line down buttons to increase or decrease the number of pay lines you are playing. Remember that to win the progressive jackpot you have to bet at least five dollars. Are you ready for even better news? The Red and the Black icons are the scatter symbols in the game. When you hit the scatter symbol anywhere on the reels, you will trigger the gamble feature and trigger the 21bonus game where you can double your wins! Click here to see the full list of all the Slotland casino games. 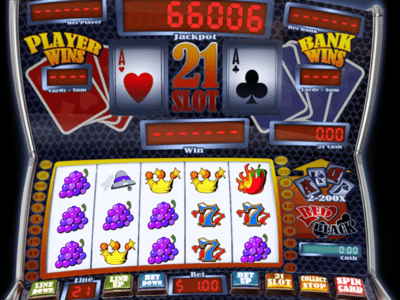 Start playing the Slot 21 video slots game for real money and start your winning streak. The progressive jackpot at Slotland casino is over two hundred thousand dollars and waiting for one lucky winner. Will you be next? Take action now by clicking on our Slotland links and banners and claim your free spins no deposit bonus without entering a coupon code. Overall, the slot 21 slots game is pretty good. 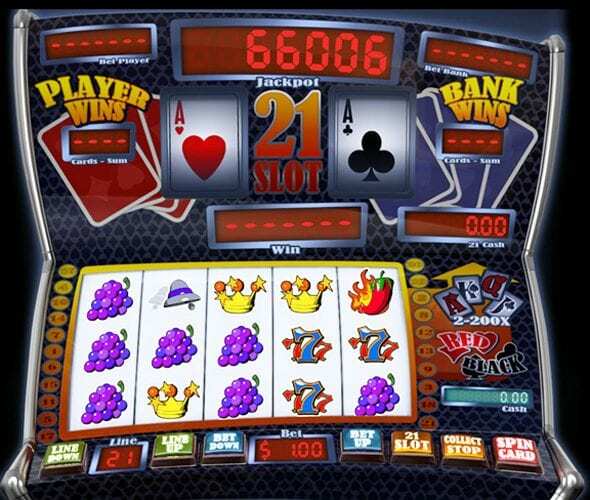 Slotland’s proprietary gaming software powers this video slot game that resembles a video blackjack game. If you are a fan of playing blackjack as well as slot machines, this game may be a perfect fit for you. Slot 21 is available at Slotland and WinADay casinos. Have fun and we hope you score 21 as many times as possible with this hybrid slot machine.